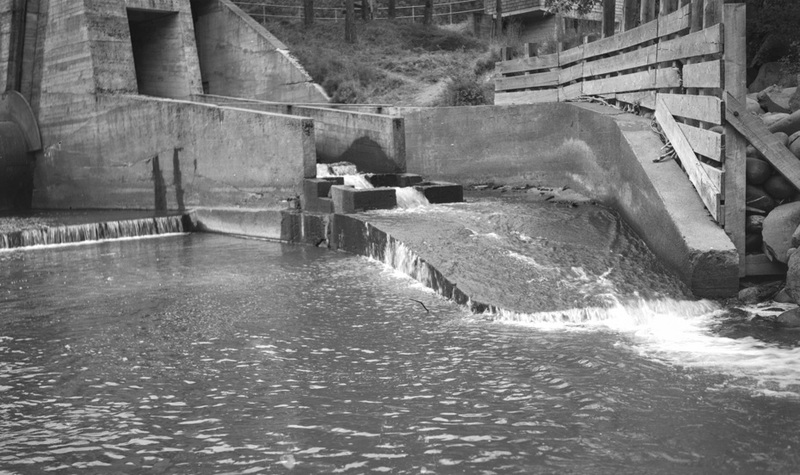 This is the fish ladder at the Powerdale Dam in 1946. Can someone fill us in on this structure? Was it part of the original 1923 dam, and did it work at all? The dam was removed in 2010, with restoration of historic fish runs being the major driver. I understood the reason for breaching the dam but am sorry they spent so much removing all traces. The same is being done across the river, no longer can we obtain before and after pictures. Here's a link to the last photo I ever took of Copper Dam. This was take shortly before they started working on the removal. I agree with Kenn. I understand the removal, but I don't understand the time and money spent to remove every trace of the history. I can only assume the fish ladder worked and it appears to be located on the west side of the dam. In 1996 ODFW constructed a fish ladder and “trap” on the east side of the dam, in order to study the Steelhead and Chinook Salmon returning to the Hood River. The purpose of the trap was to hold back the hatchery fish by looking for the adipose fin….no fin = hatchery fish. The wild fish were released, to continue up stream for breeding and a select few fish were kept for hatcher broodstock. The floy tag had a number, which identified a specific fish as part of a large study ODFW used to track these fish. It used the data, to set catch limits on specific bodies of water during the season. Once the hatchery fish were tagged, they were transported to the mouth of the Hood and released. If the same fish came back through the trap on the third time, it was trucked to Laurence Lake, Kingsley Reservoir or Lost Lake. These fish were really a prize, if caught in one of the lakes. ODFW augmented data collection, of the fish caught by fisherman, by employing seasonal creel checkers that interacted, real time in the field. They logged any floy tag data, species, size, location and removed a few scales for the biologists to determine the age of the fish. thank you for your posting Dale. I am not a fisherman, but sure like history and your info on how we tried to protect the fish.